From the end of the world springs a global publishing empire. Skybound. 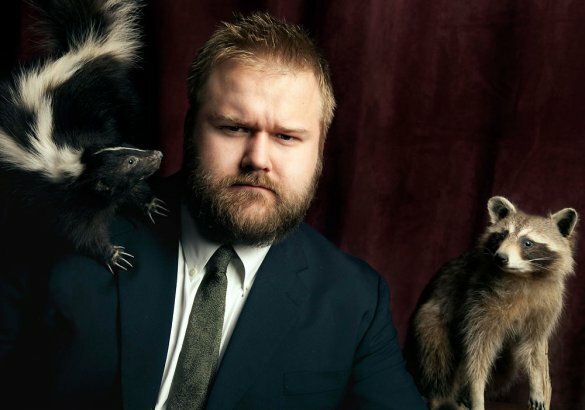 Apart from publishing Kirkman’s own work, its goal is to discover and nurture the next generation of comic creators, pay them large enough advances to complete their projects, and develop them into film and television franchises. Since announcing the launch of Skybound at the 2010 San Diego Comic Con, the imprint has grown an estimated 200%, selling in some 100 countries–catapulted by the global popularity of Walking Dead and Kirkman’s ascent to pop culture personality. Here, he manages a six-person staff that oversees 30 collected editions a year, and six monthly titles–including Super Dinosaur, Invincible, Thief of Thieves, The Infinite, and Witch Doctor–which may increase to as many as 10 this year. So far, there’s interest from film and TV, but nothing Kirkman can discuss. Kirkman, 33, juggles the creative and managerial aspects of his businesses by trusting his staff to do their jobs, branching out into genres that energize each other, and mentoring proactive talent that doesn’t require a lot of hand-holding. “I’m pretty good at delegating, but I can be hands on when I need to be,” he says. “There are divisions of Skybound that I let others handle–like the two guys who oversee the international sales. I write somewhat fast. I work on comics in the morning, then spend five to six hours in the Walking Dead writers room, which is basically sitting in a chair talking about story. If I get too far behind, I’ll catch up on comics at night. It’s a juggling act, but I enjoy having my hand in so many pies. Skybound’s business model is similar to that of a traditional book publisher. Creators are offered an advance against royalties, which are split in favor of the creator after recouping the advance. Where Image offers complete creative freedom and creator ownership (after royalties recoup printing costs), Skybound offers advances, international distribution, plus marketing, story and design guidance, but is financially invested in the property. Kirkman grew up wanting to be an artist, began working at a comic store in his native Kentucky in his teens, and self-published his first comic, Battle Pope, in 2000, at age 21. He turned to writing after deciding he wasn’t very good at art and it was too time consuming, and wrote his first comic for Image, SuperPatriot, in 2002. Walking Dead came the following year, followed by a half-dozen other titles, and with their success, an invitation to become a partner in 2009. Since premiering the following year, the Walking Dead TV show not only broke cable ratings records, but propelled the WD comics to the New York Times best-seller list.